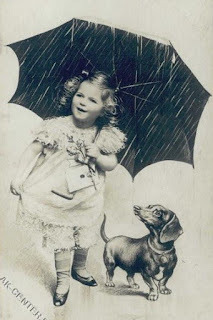 I am taking a break in my Pet Related Collections series to talk to you about rain. 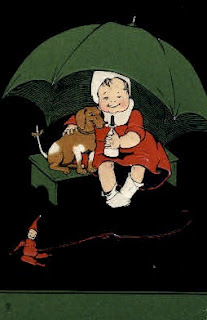 I don't mind a little light rain in Spring or Summer, when it is nice and warm and just drizzling. More than that and I am not a fan. 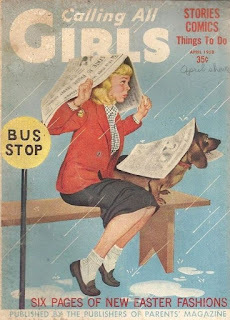 We get rain on and off here during Spring and Summer, and I was looking for dog images to show my Momma that old fashioned dogs didn't care for rain either. 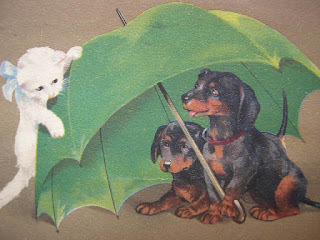 Instead, I found these vintage dachshund images showing rainy day doxies. I thought you might enjoy seeing them too. 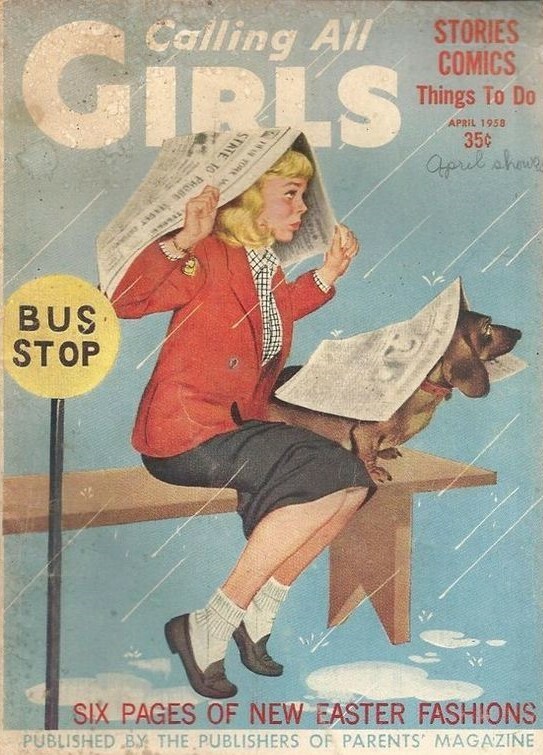 This is a vintage Calling All Girls magazine cover featuring a girl and her dachshund, inside (as they should be) watching the rain. 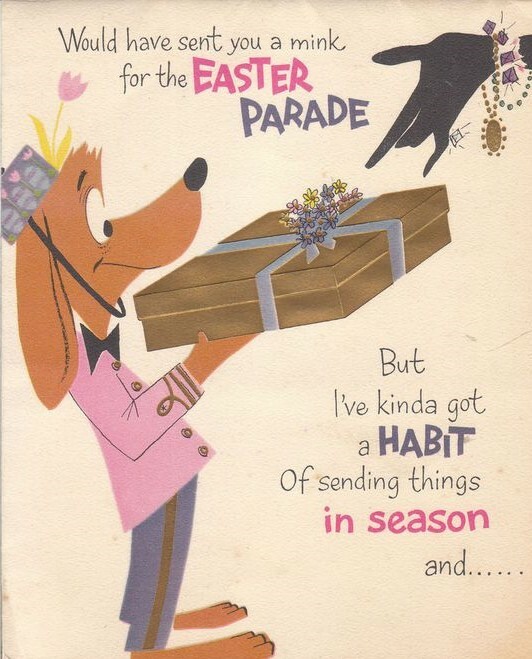 It is dated April 1959. This dachshund helps a teenage girl wait in the rain. They are both covered with newspapers. I hope it is keeping them dry! 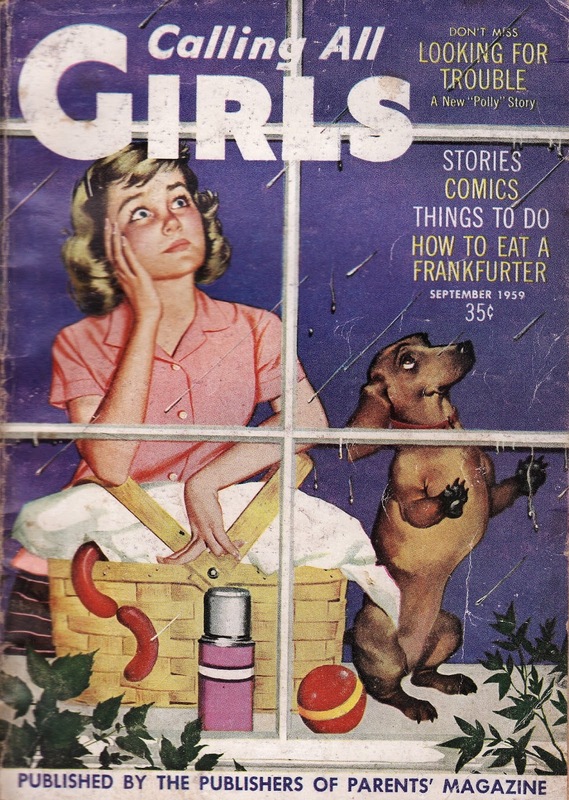 This Calling All Girls magazine cover is from April 1958. 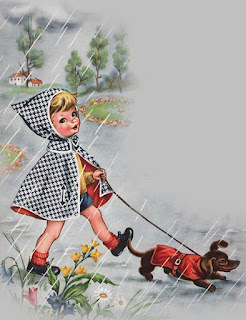 Vintage illustration of a dachshund walking in the rain with a little girl. The girl is carrying a pitcher. Vintage postcard of a little girl cuddled up with her dachshund under a big green umbrella. Vintage illustration of two dachshunds under an umbrella -- with a white cat playing peek-a-boo. 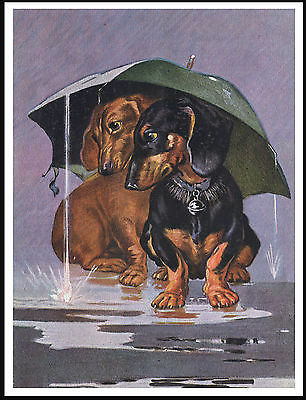 Vintage illustration of two dachshunds under an umbrella in the rain. Vintage black and white postcard of a dachshund and a little girl under an umbrella. 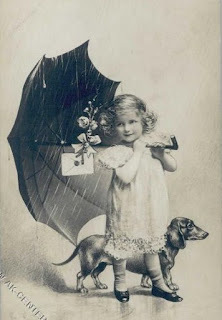 It is a cute picture but she needs to hold the umbrella up so they both will stay dry! 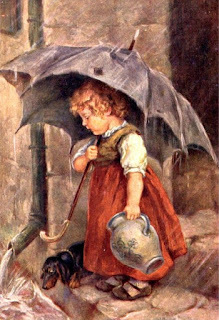 This vintage postcard is from the same series -- a dachshund and a little girl walking under an umbrella. 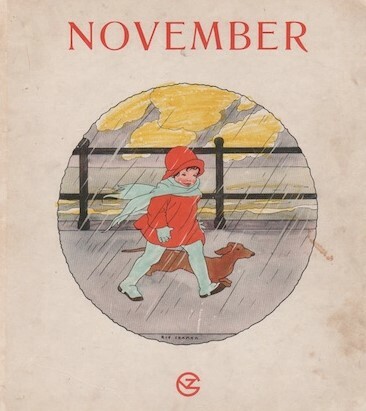 This children's book illustration reads NOVEMBER and it depicts a dachshund walking with a little girl who wears a red coat. In this picture, the dachshund wears a red coat and walks with a little girl in the rain. 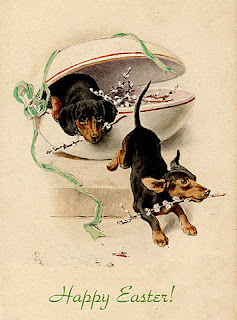 This vintage illustration is by Maria Pia Franzoni Tomba. 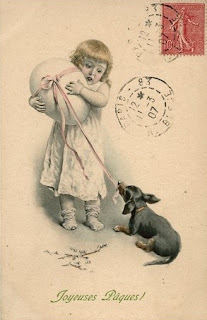 She did many sweet illustrations of children, usually signed "Mariapia." I hope you enjoyed this little rainy day excursion with me! This is the way I enjoy rain best -- cozy and warm inside, just looking at pictures of rain. I would like to continue with my series of Pet Theme Collections next week. If you want to join with sharing some photos of any pet theme (or animal theme) collection, I would love to hear from you. Please just let me know in the comments, below! Wishing you a wonderful weekend - lots of sunshine and no rain! I hope you are having a wonderful week! 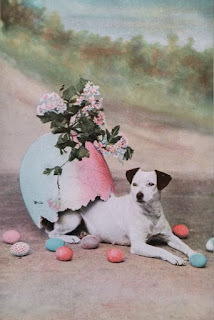 I'm excited to begin a series of posts about pet related collections today. 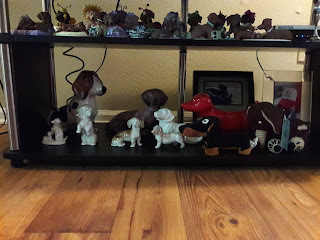 Rebecca has stopped by to share her dogs and pictures of her dachshund collection here. Abby: Rebecca, I'm so glad you visited today! Could you please tell my readers about your dogs? Rebecca: I have a dachshund named Freckles, now 11 years old, and a rescue (half dachshund and half Labrador Retriever) named Nadia, now 4 years old. This is how I started. 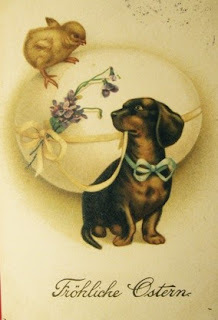 I never thought I'd like or get a dachshund but I wanted a short haired dog. So 11 years ago my husband brought Freckles to my work. 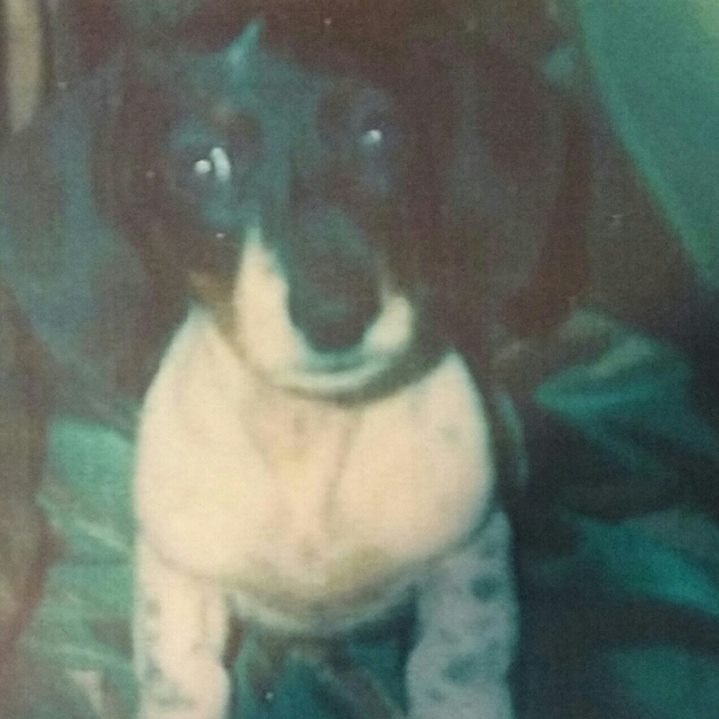 That's a baby picture of her. Three and a half years ago we rescued a dog Nadia, now 4 years old. 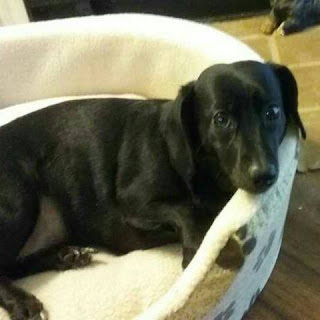 She is a dachshund and Labrador mix. Abby: I loved hearing about Freckles and Nadia! They are both so cute. That baby picture of Freckles is adorable. What do you collect? Rebecca: My collection started (see figurines on top shelf) maybe 3 or 4 years ago. I started getting a catalogue from the Bradford Collection and that's how my collection started. 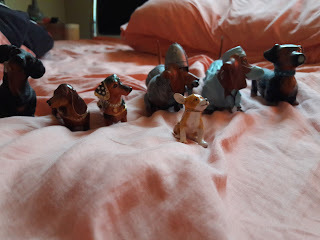 I found the figurines on the bottom shelf about 4 or 5 months ago. The top shelf has figurines from the Bradford Collection and the figurines on the bottom shelf are from online. 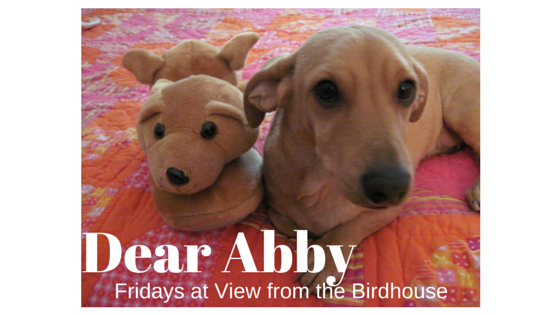 Abby: Thanks, Rebecca, for visiting! 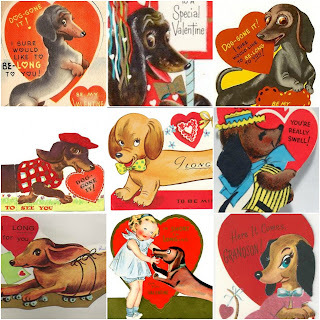 I really enjoyed hearing about Freckles and Nadia, and seeing all your wonderful dachshund collectibles. Friends, if you would like to leave a question for Rebecca, you can do so in the comments below. 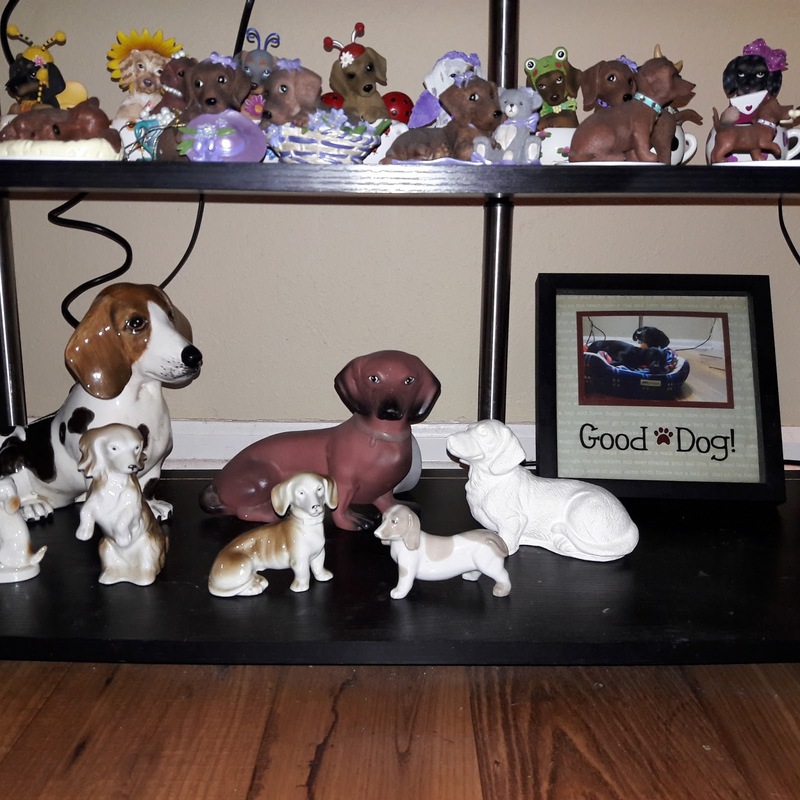 If you would like to feature YOUR collection, please let me know that too (with your email). Thanks, and have a wonderful weekend! 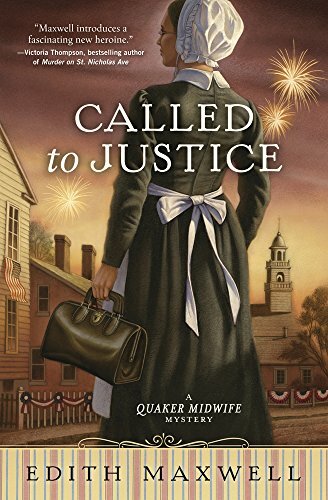 When her grandmother’s will wrenches Sara back home from New Orleans, she learns more about Margaret Van Buren in the wake of her death than she ever did in life. After her last remaining family member dies, Sara Jenkins goes home to The Hideaway, her grandmother Mags’s ramshackle B&B in Sweet Bay, Alabama. She intends to quickly tie up loose ends then return to her busy life and thriving antique shop in New Orleans. Instead, she learns Mags has willed her The Hideaway and charged her with renovating it—no small task considering Mags’s best friends, a motley crew of senior citizens, still live there. Rather than hurrying back to New Orleans, Sara stays in Sweet Bay and begins the biggest house-rehabbing project of her career. Amid Sheetrock dust, old memories, and a charming contractor, she discovers that slipping back into life at The Hideaway is easier than she expected. Then she discovers a box Mags left in the attic with clues to a life Sara never imagined for her grandmother. With help from Mags’s friends, Sara begins to piece together the mysterious life of bravery, passion, and choices that changed Mags’s destiny in both marvelous and devastating ways. 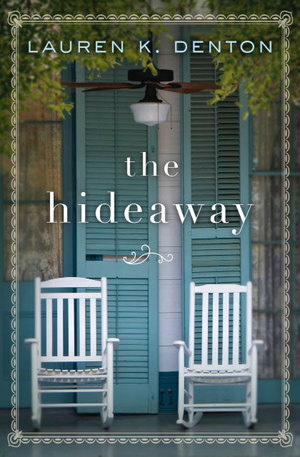 The Hideaway is a wonderful debut novel by Lauren K. Denton. It tells the story of Sara, a single woman who owns a successful antique store in New Orleans. When her grandmother Mags passes away suddenly, she discovers she has inherited her old Victorian bed and breakfast in Sweet Bay, Alabama. Mags discovered the bed and breakfast in 1960 when she was fleeing her unfaithful husband and an unhappy marriage. Spending time there changes her life. Sara also finds her life changed by the time she spends in Sweet Bay. I really loved everything about this novel. Sara and Mags are so likeable and sympathetic; I found a hard time putting the book down at night because I wanted to know what would happen next with their stories. This is a dual storyline book, set in the 1960's - 1970's (Mags) and the present (Sara). The dual storylines are so well done. I really enjoyed the way the author captured the different times and characters. 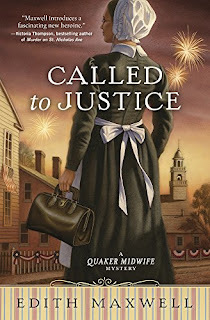 I loved the southern setting and the warm, nostalgic tone of this story. This is a book about love, about family, about second chances, and finding yourself in unexpected ways. I would love to read a sequel to The Hideaway because I want to know what happened next with these wonderful characters. I recommend this book highly for fans of women's fiction, southern fiction, and uplifting summer reads. Born and raised in Mobile, Alabama, Lauren K. Denton now lives with her husband and two daughters in Homewood, just outside Birmingham. 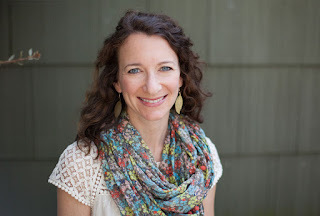 In addition to her fiction, she writes a monthly newspaper column about life, faith, and how funny (and hard) it is to be a parent. On any given day, she’d rather be at the beach with her family and a stack of books. The Hideaway is her first novel. One lucky reader will win a copy of The Hideaway. This giveaway is open to the U.S. and Canada, and it will end at midnight on April 28. The winner will be notified by email and needs to respond within 48 hours. 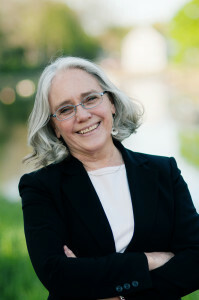 The author or her publicist will mail the book directly to the winner. 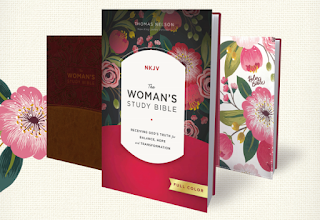 You're invited to receive God's truth for balance, hope, and transformation in the fully revised and redesigned The NKJV Woman's Study Bible. The new edition features a beautiful, full-color redesign and poignantly reveals the Word of God with Scripture insights and the contributions of more than eighty women from a wide variety of ethnic, denominational, educational, and occupational backgrounds. Special features designed to speak to a woman's heart appear throughout the Bible text, revealing Scripture-based insights about how godly womanhood grows from a woman's identity as a Christ-follower and a child of the Kingdom. When I first saw The Woman's Study Bible, I knew it was a very special Bible. It is big and beautifully designed, with a lovely cloth floral cover. The floral motif continues on the first few presentation pages, and at the top of each book of the Bible. There are several special pages at the beginning of the Bible, including a Ketubah Marriage contract (traditional Jewish marriage contract), Family History to fill out, Special Family Memories, and page to list My Spiritual Mothers. There are several articles about women and the Bible after the preface. The contributors are women from diverse backgrounds. This is truly a study Bible. There is fascinating information to study at the beginning of each book of the Bible: title, author, date, background, themes, outline. Pages have footnotes with more information. There are also short sections within each book of the Bible for more detailed reading. For instance, in Genesis there are sections on Sarah, Hagar, Rebekah, Dinah, and more. Between the Old and New Testaments there is a section with fascinating information like Flowers of the Bible, Vegetables of the Bible, Bitter Herbs of the Bible, etc. The New Testament is red letter, with the words of Christ in red. This is the NKJV (New King James Version) translation, which is very readable and also preserves a lot of the poetic language of the traditional KJV translation. The font is 11 point, which I find easy to read. The Bible lays flat as you open it, so you can set it on a desk or table and read it easily. There is a substantial appendix including Money and Measurements of the Bible, Index, Concordance, and Maps. I particularly like the Index, where you can look up people, places, or topics (i.e. Peter's Mother-in-Law, Pentecost, Prayer, Praise). The Woman's Study Bible would be a perfect Bible for daily studies, and it also would be a really special gift. I am very impressed with the beautiful quality of this book and the loving scholarship that is included for study. This spring, cultivate your heart's spiritual roots and enter to win the Grow in the Word Giveaway! Enter today by clicking the icon below, but hurry! The giveaway ends on April 27. 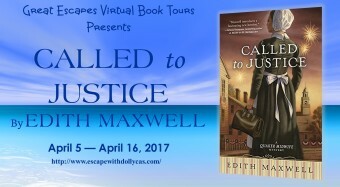 The winner will be announced April 28 on the Litfuse blog. I hope you are having a good week! 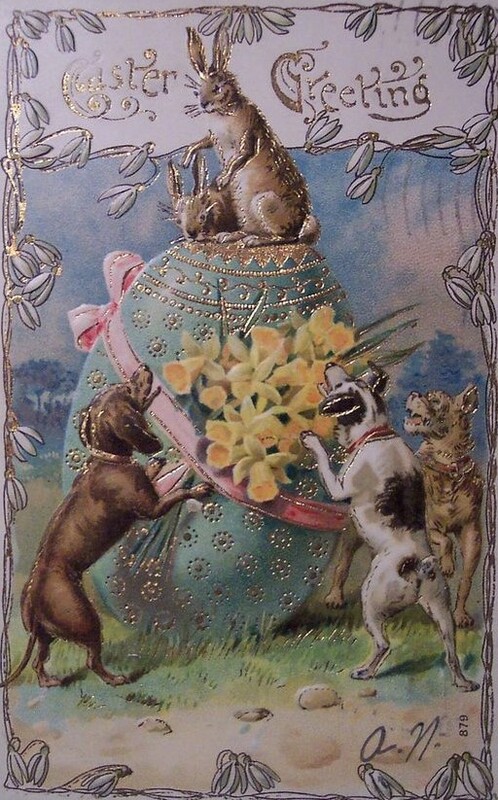 It is beautiful Spring weather here and I am looking forward to Easter weekend. 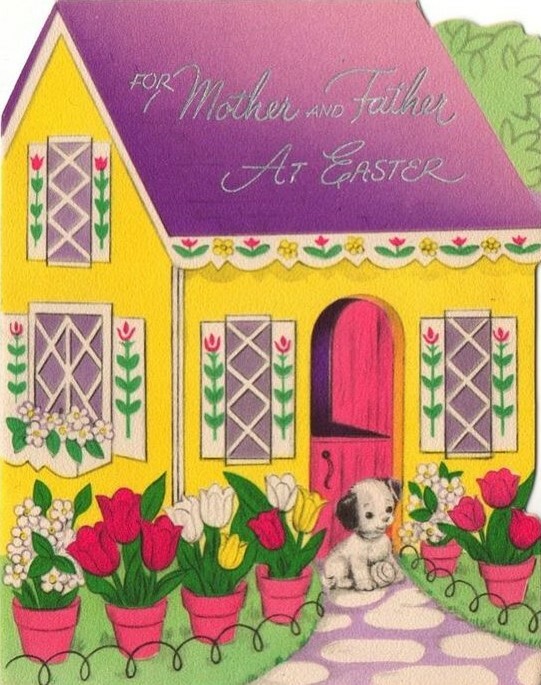 I thought you might enjoy sharing some vintage Easter cards today. 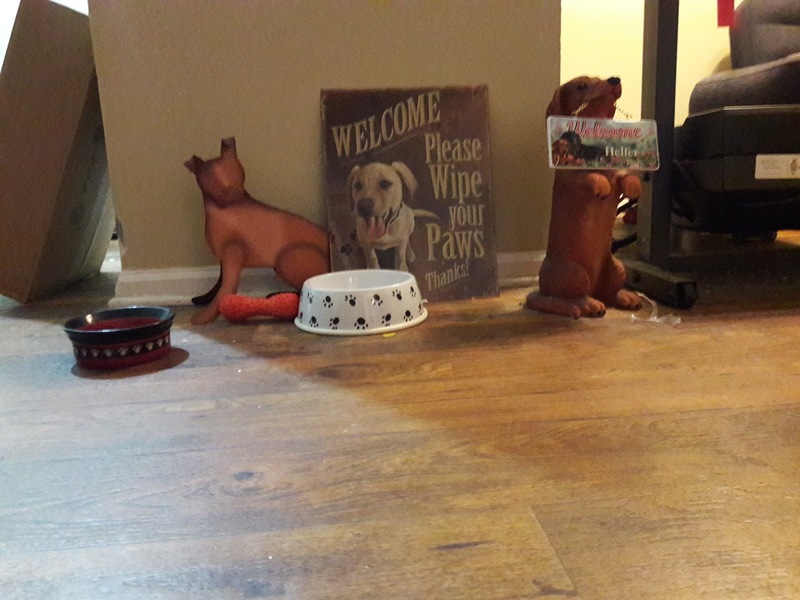 They all include dogs! A little dachshund helps a girl with the ribbon on a giant Easter egg on this vintage postcard. 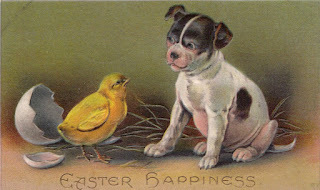 A little yellow chick sits on an Easter egg and watches a dachshund on this vintage postcard. 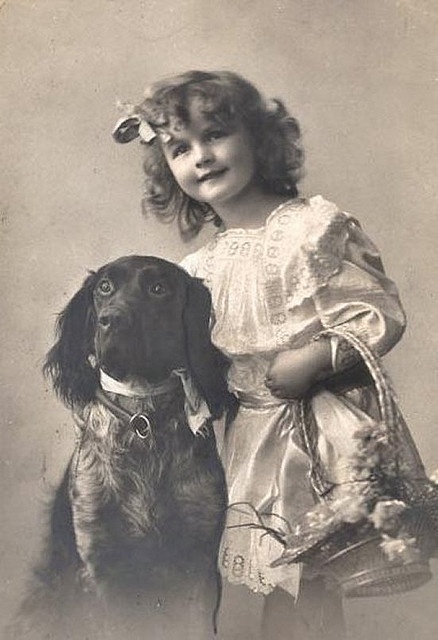 This is a RPPC (real photo postcard) featuring a little girl with a dog and an Easter basket. 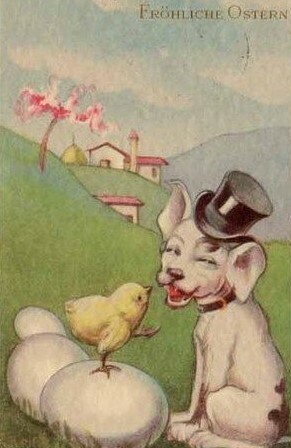 Vintage postcard -- a dog surprises a chick! 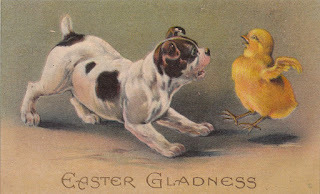 Vintage postcard -- a dog is surprised by a chick who has just hatched. 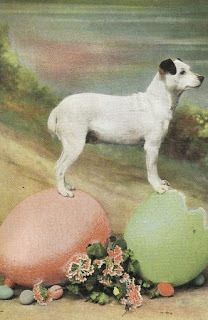 Vintage Easter postcard - did this dog hatch from the giant Easter egg? On this vintage postcard a dog climbs on top of two big Easter eggs. A bulldog makes friends with a chick on this vintage postcard. This vintage Easter card is for "daughter and her husband." 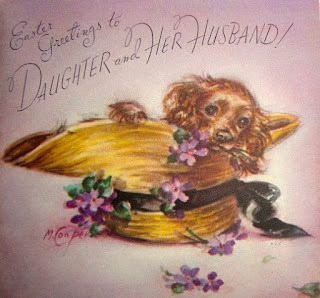 A cocker spaniel lounges in a big straw hat. 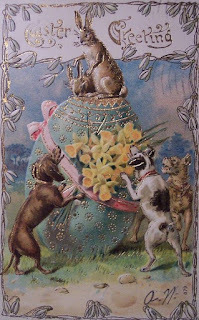 A Scottish Terrier pulls an Easter egg carriage on this vintage card. A hound dog has a gift for the Easter Parade on this Mid-Century vintage card. This is one of my favorites! A sweet puppy sits outside of a cute storybook cottage on this vintage Easter card. 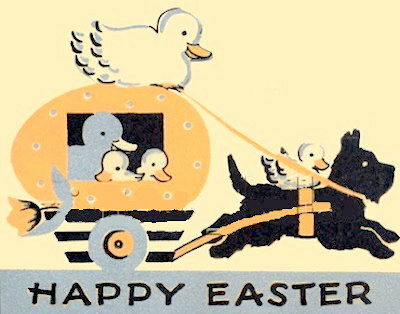 I hope you enjoyed these vintage Easter cards, and I wish you a wonderful holiday weekend! Next week I will begin my new series about pet collectibles. 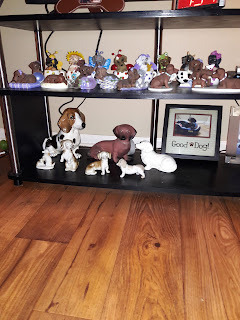 If you collect any pet themed items, I would love to include your pictures at the blog! Just let me know (with your email) in the comments. Thanks! It has been quite a week here! We had storms on Monday and then very strong storms Wednesday. They included rain, lots of wind, thunder (shudder! ), and even hail against the windows. 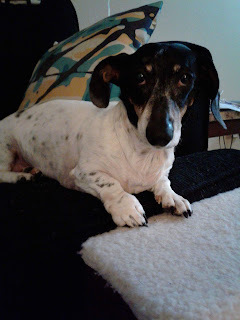 I am glad to settle in for a quiet day and enjoy visiting with you. I would like to invite you to share your pet themed collections at my blog! I think this will be a fun new series. Momma collects vintage Dachshund Valentines, photos, and storybooks. 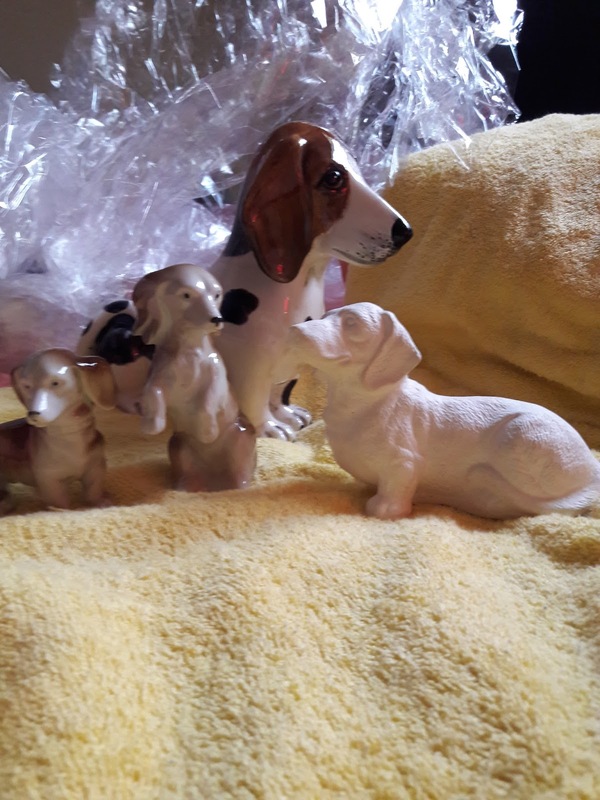 We have friends who collect breed specific dog treasures or who love cat theme collectibles or dog theme items in general. If you are interested in participating, please include your email address with your comment below. I would love to hear from you!